Pictured above: Hon. Ralph Eichler, Minister of Agriculture for the Province of Manitoba with Rick Wowchuk, MLA for Swan River, Community Foundation of Swan Valley Board Members and Herb and Bernice Bohnhardt. 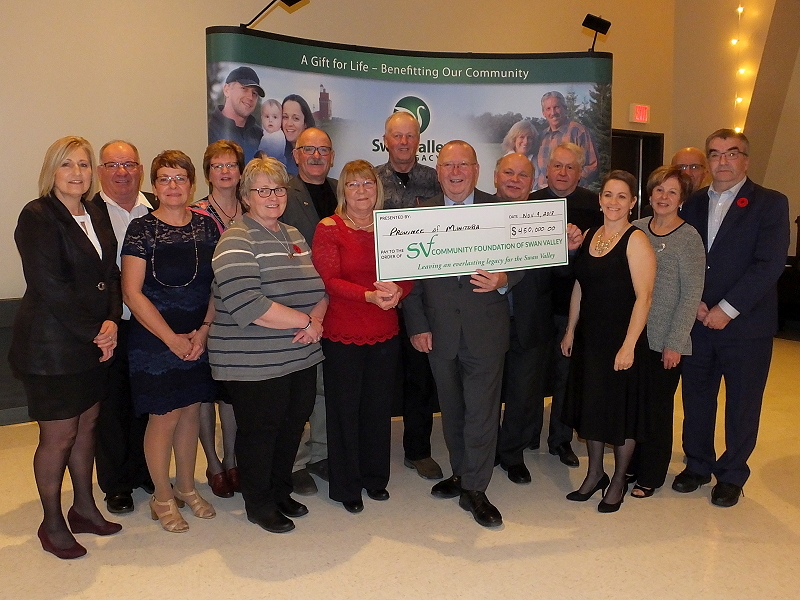 Honourable Ralph Eichler, Minister of Agriculture for the Province of Manitoba, attended the Community Foundation of Swan Valley (Foundation) Cultural Gala on November 9, 2018 to present a cheque in the amount of $450,000 that will be used to create the Cherban Endowment Fund. Twin brothers Alexander (Sandy) and Marvin Cherban were born April 8, 1937 in Winnipegosis, MB. In 1970, they purchased 480 Acres of land 8 1/2 miles NE of Birch River. The brothers farmed for many years, then rented out their land until the time of their deaths. They instructed the executor of their estate, Herb Bohnhardt, to sell their property and assets and give the proceeds to the Manitoba Department of Agriculture. Knowing the brothers’ love for the Swan Valley, Bohnhardt advocated persistently to have the funds returned to the Swan Valley. “After 3 years of negotiations, we have half of Cherban’s Estate for the Community Foundation of Swan Valley and for Bursaries for Students enrolled into some form of agriculture.” said Bohnhardt. In agreement with the Province of Manitoba, the funds will be distributed in 2 ways. A sum of approximately $75,000 will be set aside to provide two $1,500 annual scholarships; one for a graduating SVRSS student continuing their education in an area of study related to agriculture or ag business and one for a former SVRSS student enrolled in an agricultural related field of study at the post-secondary level. The remaining funds of $325,000 will be invested to provide grants to groups, organizations and projects that are broadly related to agriculture and/or community economic development and rural living in the Swan Valley. “With this most recent endowment, the total value of the Foundation will be almost $2.9 million.” said Lorne Henkelman, Chair of the CFSV. “At the current spending rate of 4%, these new funds will eventually generate $18,000 each and every year for grants and scholarships.” he added.